The church of St. Adrian, isolated and hidden on the edge of the woods, far from the sight of passers-by, is a small and very precious jewel. The church that we now see is the result of an extraordinary stratification of works and changes executed in various periods. However, we can date the probable (re)construction of the actual oratory between the XI and XII century. This is the period when a group of Benedictine nuns of St. Victor of Meda took possession of the oratory of Olgelasca. In fact they promoted important works of reconstruction of the pre-existing building, leading up to the state in which we now see it. 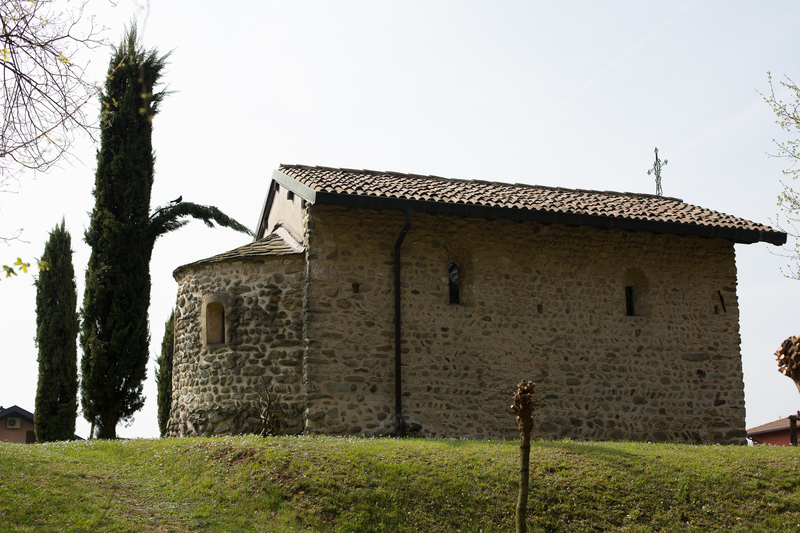 The location of the church, even now isolated and off the beaten track, is most probably explained by supposing that the present church was built over a pagan temple and a pre-existing church, before the reconstruction done by the Benedictine nuns. The sites of pagan temples were normally chosen in isolated places, outside built-up areas or in our case near woods, as for example the Galliano Basilica. On the contrary, Christian churches would be built in the centre of the built-up area and so becoming a strategic point of reference. Another peculiarity is the fact that the church is dedicated to St. Adrian, noble knight from Nicomedia, who suffered martyrdom (by crushing of arms and legs) under the Roman emperor Diocletian. St. Adrian, however, was a saint not well known in the diocese of Milan nor particularly venerated in Italy. The choice of the Benedictine sisters to dedicate the oratory to such a martyr is certainly due to the similarities with the story of St. Victor, to whom the convent of Meda was dedicated. Both saints, based on tradition, were noble knights, young and who lived and suffered martyrdom during the Roman Empire. Even legends about their death talk of miraculous thunderstorms to stop the execution of the sentence. In its simplicity, the church internally preserves pictorial works of art of extreme interest, both for their high level of quality and for their iconography, which proposes original solutions. In the apse behind the altar on the left, there is the image of St. Adrian (beginning of XII century) in his praying position (frontal view with open hands). The detail of the sleeves of the tunic is very interesting, being preciously lined inside, a sign of nobility. 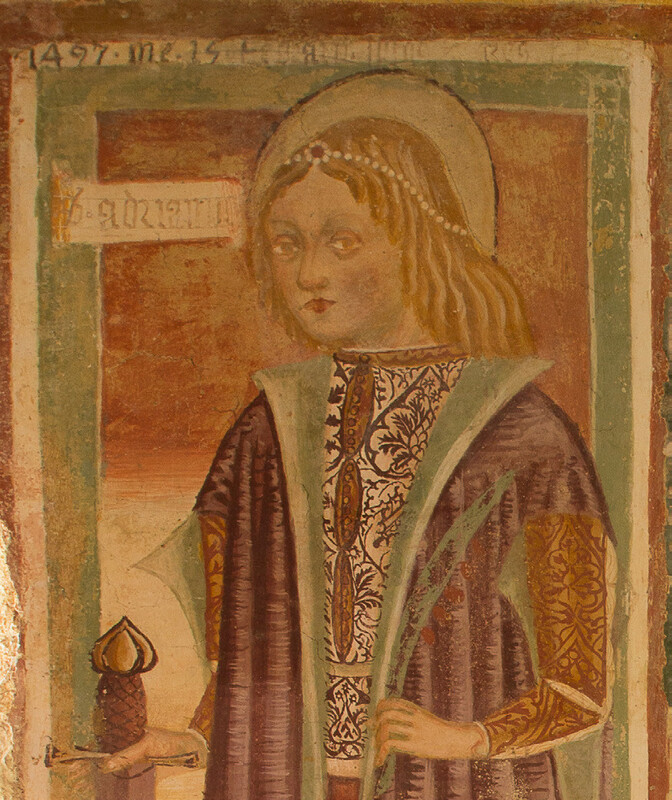 Again a little to the right St. Adrian reappears in the most recent icon, dated 1497; here the saint is pictured as a blond young man (three quarters view) adorned with clothes of precious damask and with a crown of pearls on his head; a sword and spurred boots definitely indicate his knightly rank. The apse also contains images of St. Bernardino and, to the extreme right, St. Sebastian with arrows in his hands referring to his martyrdom. We must underline the iconographic complexity of the apsidal vault. Where normally you would expect to see the image of Christ in a Mandorla (lozenge shape), here was chosen the Trinity: Christ crucified held by the shoulders by God the Father and between these two the dove representing the Holy Spirit, all of this inserted in an rayed Mandorla that contains the whole group with the effect of a halo. Around the Mandorla there are the Tetramorfi, symbols of the four Evangelists (angel, lion, bull and eagle) holding the four gospels. At the corners of the vault are the saints Rocco (left) and Sebastian, traditionally advocated against pestilence. On the north side, the only surviving image, there is a very precious Lady of the Milk: a refined and noble image, not only for her noble dress embroidered with golden thread, but also in her distant gaze and the austere look of her crystal eyes. In her arms Christ the Baby holds a little bird, portent of His crucifixion. Turning to the south wall, first of all you can see traces of an old entrance door and an archaic holy water font excavated in the wall itself. In the centre of the wall at the ground level, there is represented a scene of the life of St. Gregory; it shows the saint celebrating the liturgy before a finely adorned altar. 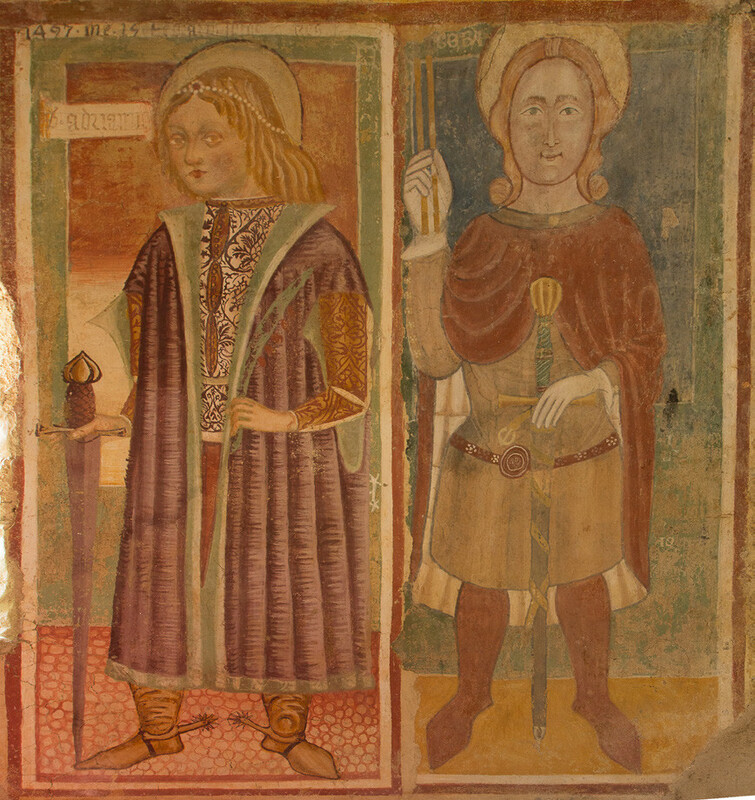 Above to the right, there are two other figures: to the right St. Bovone, a knight who converted to Christianity and dedicated himself to a contemplative life and who died in Voghera after returning from a pilgrimage to the tomb of St. Peter; to the left, St. Thomas with the girdle ofthe Virgin Mother, that she dropped from heaven as a tangible sign of her Assumption (this relic of the Lady of the girdle is kept in Prato).